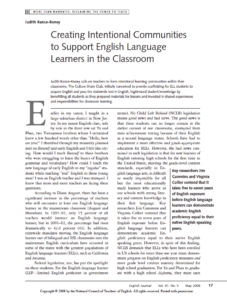 Summary: How can teachers support English learners, including recent immigrants, in language acquisition while also investing all students in creating a classroom culture that encourages shared experiences, knowledge construction and the integration of resources that ELs bring? Judith Rance-Roney’s answer was to create the Culture Share Club as an intentional learning community within the classroom. Rich descriptions of many effective practices with solid theoretical and research grounding makes this article a must-read for study groups, professional learning communities, or professional development.